Benedictine Father Severin Messick, a monk and priest of Saint Meinrad Archabbey and longtime pastor of St. Michael Parish in Greenfield, died of cancer on Sept. 28 at Hancock Regional Hospital in Greenfield. He was 57. The Mass of Christian Burial was celebrated on Oct. 4 at Saint Meinrad Archabbey Church in St. Meinrad. Benedictine Archabbot Justin Du Vall was the principal celebrant and homilist. Burial followed at the Archabbey Cemetery. A memorial Mass will be celebrated at St. Michael Church in Greenfield at a later date. Benedictine Father Prior Kurt Stasiak of Saint Meinrad said Father Severin spent most of his monastic life serving God and the Church in parish ministry in three dioceses, and was proud to be a monk of the archabbey. Father Severin “always had a smile on his face,” he said, loved the Latin language and enjoyed reading. Msgr. Anthony Volz, pastor of St. Barnabas Parish in Indianapolis and a longtime friend, remembered Father Severin as a scholarly priest who related extraordinarily well with his parishioners. Msgr. Volz said Father Severin enjoyed ministering to the people at St. Michael Parish for 13 years. Father Stephen Jarrell, pastor of Christ the King Parish in Indianapolis and a longtime friend, said people referred to Father Severin, Msgr. Volz and himself as “The Three Amigos” because they enjoyed spending time together and went on annual vacations in July. Mark Stephen Messick was born on July 12, 1954, in Indianapolis to Henry and Anna (McGuire) Messick. 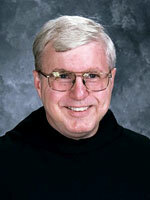 He attended Immaculate Heart of Mary School in Indianapolis, graduated from Bishop Chatard High School in Indianapolis and earned a bachelor’s degree in classics from the former Saint Meinrad College in St. Meinrad in 1973. Four years later, he was invested as a Benedictine novice. He professed his simple vows on Aug. 6, 1978, and was ordained to the priesthood by the late Archbishop Edward T. O’Meara on May 2, 1982. He completed graduate studies in Latin and classical literature at The Catholic University of America in Washington, D.C. In 1983, Father Severin began his first ministry assignment as associate pastor of St. Mary-of-the-Woods Parish in Whitesville, Ky., in the Diocese of Owensboro, and a teacher at Trinity High School there. Two years later, he was named associate pastor of St. Ann Parish in Morganfield, Ky., and an advocate of the Metropolitan Tribunal in the Diocese of Owensboro. In 1986, Father Severin was called to service in the Diocese of Evansville, where he ministered as associate pastor of St. Mary Parish in Huntingburg, Ind., for six years. In 1992, he returned to St. Ann Parish in Morganfield as pastor. In 1996, Father Severin served as administrator of the Church of the Immaculate in Owensboro, Ky., then began his parish ministry in the Archdiocese of Indianapolis as co-pastor of St. Paul Parish in Tell City, St. Michael Parish in Cannelton and St. Piux V Parish in Troy. The following year, he was appointed administrator of St. Therese of the Infant Jesus (Little Flower) Parish in Indianapolis. In 1998, Father Severin was named pastor of St. Michael Parish in Greenfield, his longest ministry assignment, where he cared for the spiritual needs of parishioners until his death. For nearly seven years, Father Severin also served as a judge of the archdiocesan Metropolitan Tribunal. In 2010, he was appointed temporary administrator of St. Mary of the Immaculate Conception Parish in Rushville while continuing as pastor of St. Michael Parish in Greenfield. Surviving are his mother, Anna Messick of Greenfield; a sister-in-law, Suzanna Messick of Indianapolis; two nieces, Michelle Johnson of Carmel, Ind., and Cynthia Lee of Indianapolis; two great-nieces and a great-nephew; and one great-great niece.